I'm sick, spent the entire day sleeping (then getting up to eat, then sleeping more), and I've probably got a fever. So that's my excuse; I'll probably delete this and deny all knowledge of it once I'm well. So no, �no comic today.� Yes, I know this is turning into bloody stick figure week. Good thing I announced the next issue for Monday week rather than today. Google image has me believe that's the Polish national costume there. What popular song from the nineteen-eighties does the art allude to? Men without Hats � The Safety Dance. As a bonus, here's my favourite song by them, Security. Boring video though. (Note veejay's silly hair � only of course, they weren't called VJs back then!) Compare to the more upspeed Security (live), where amusingly, singer Ivan looks like some weird brooding cross between Trent Reznor from Nine Inch Nails and the guy who played Satan in The Stand. Yeah, that was the folk of the eighties ! What's with the drummer, though? Wearing a shirt of your own band? How gauche! 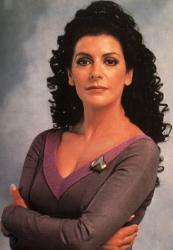 You are Deanna Troi. You are a caring and loving individual. You understand people's emotions and you are able to comfort and counsel them. No DS9. So where do I have to go for my Trill spots? Continue reading "I am Deanna!" Yeah, you thought I was going to list the obvious ones. Breakfast at Tiffany's; Mortelle Randonn�e; Girl, Interrupted; Merry Andrew. Batman: The Animated Series. Have some hopes for the 10th Doctor. Hey Dad! was sheer genius in the early years. Yes, Minister was brilliant. Tiramisu, Satay, Cannelloni, Pizza. Yes, I'd do fine in Rome. Wikipedia. WapsiSquare. Nukees. Urban Dead. On the tour Eiffel. In bed with lover, in the ice hotel. In NZ, where it's not Winter, in my very own chopper. In Robinson Park, as Poison Ivy. Oh woman. Look at my blog. The last three entries are all silly quizzes. I really need to do some real entries. On the other hand, everyone has new quizzes, and I really need to take them. How about I do this marathon, get them out of the way, and then we get back to our regular programme? 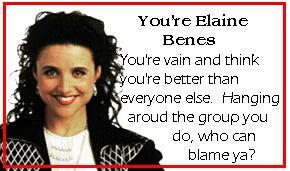 Guess that's pretty much 1oo % my self-assessment. Yay for me. Robin's and other typologies in the de.rec.spiele.rpg.misc glossary — in German. The Cyborg Name Generator now also creates basic avatars. If being a PMP is not good for you, find out what your true destination is! A.Z.U.N.D.R.I.S. — Artificial Zeta Unit Normally for Destruction, Repair and Immediate Sabotage . Destroy, fix, sabotage. Not in that order, I hope, otherwise, it'd seem a little confused even by my standards. Continue reading "Acht Fragen, acht Antworten"
creative writing, drama, crafts, music, or art. Actor, Art Teacher, Book Editor, Clothes Designer, Comedian, Composer, Dancer, DJ, Graphic Designer, Illustrator, Musician, or Sculptor. What's Your Ideal Career? via Zugschlus. No, they didn't have the M1911A, and I really don't know why I'm not Arisu. Or evil lain, for that matter. Or bloody penny bloody lain, sweety dahlin'. Bolly? She's fascinated with Greenland. She enjoys teasing animals, banlon, and seeing people running for their lives. She loves throwing garbage out the window, yet she's extremely dainty. Which Seinfeld character are you most like?